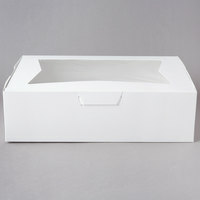 Use this 14" x 10" x 4" white window cake / bakery box to package and sell cakes, donuts, cookies, and muffins at your bakery. Not only does it have a crystal-clear viewing window to help showcase your products and increase impulse sales, it also features a one-piece construction that comes flat to maximize your storage space. Plus, it's easy to assemble. Simply fold and lock each corner into place, add your baked goods, and close the top! These are the best boxes for heavy decorated cupcakes or cupcakes with tall icing or decorations. They have plenty of space between each cupcakes when use with the 10016 Cupcake Insert - Standard - Holds 12 Cupcakes. Great height ! and the window is nice!! attracts customers when doing cupcake sale. Love these cupcake boxes with inserts. No chance of a cupcake tipping over in transport! No worries about messed up frosting from turning a corner and them tipping. I bought these boxes for my jumbo size cupcakes. They fit a dozen of my cupcakes perfectly and 24 standard size cupcakes. They quality is great and the window on the box is an awesome addition. I found that after doing a lot of research that these boxes are very practical and a great value! I have ordered these boxes in the smaller count. This batch seems to have a slight defect to one of the closures. Even with the defect in this batch, the quality of the box and the look is very good. Thank you for your review, Almetrice! We are sorry this 14 inch x 10 inch x 4 inch White Window Cake / Bakery Box - 100/Bundle arrived with some quality issues. A Customer Solutions Representative will contact you soon! This is a great box and a wonderful size to pack assortments of holiday cookies. Easy to see what is inside; good quality at a reasonable price. This item is so durable and easy to assemble. It is great for any desserts and the window design is perfect for people to see the goodness and the designs of any cake and cupcakes. We use this box for all of our 1/4 sheet cakes, as well as for boxing pastries and cookies from our bakery case. They are very sturdy and have such a nice presentation. This isn't as sturdy as I thought it would be, but it is still a good box. They come well bundled, but the shipping on this particular package was a bit rough....they had jammed multiple orders together and it was SO heavy, the FedEx driver refused to bring it further than the door. A great box for holding our dozen assorted bagel boxes. Love the quality and easy assembly of this window box. Comes well packaged and very pleased. Great product for bake goods take out orders. Price and shipping are very reasonable and being given able to show case our designer muffins and cookies is well worth it. I ordered this box for multiple use in my shop. It can hold just about any bakery product from donuts to cupcakes to cooies and lots more. My cupcakes look fabulous in these bakery boxes! Customers love the clear window view, especially when I send them a picture prior to pick-up. Thank you for creating a well-made product, easy to assemble, at a great value. This is great when you want customers to see what you are selling. It also keeps the need to open the box at handoff down which only lets air in when you do it which is no friend to bakery products. Closes great and looks pretty! These are easy to assemble and very sturdy. The window gives a cute sneak peak to what's inside! I use these for cupcakes and cakes. They are a great hight for taller cupcakes. These bakery boxes with the window are good quality, easy to assemble, and make our bakery products looks great! We will be buying these again. Good quality at a great price. They show our cakes and cupcakes off nicely... The cupcake hold we got form web fit perfect in here. These boxes are easy to assemble and just the right height. The 14" x 10" x 4" White Window Cake / Bakery Box - 10 / Bundle is great 10 packs that are durable and sturdy we will be ordering more. These are excellent boxes at an unbeatable price. I use them with a cake board for sheet cakes and bars, or with a cupcake insert for 12 cupcakes. Will definitely order again! we use this size box a lot it's perfect for 9x13 sized cakes and is high enough that a double layer cake fits in it nicely. It's also perfect for holding 3+ dozen cookies safely and it looks great. Easy to decorate up with a ribbon or a sticker. I love this box! Box is easy to assemble and my cookies/cupcakes look like the stars of the show when I use this box. I put my sticker/logo in the middle of the clear area for a sleek look. Easy box assembly as well. Good quality boxes at a great price. The one missing star is for the fact that each box has to be individually folded. Other than that I like them. These are easy to assemble and love the window so you can preview your baked goods. They are sturdy and are a great product for the price. I LOVE these boxes very easy to put together I use them when delivering cookies, cupcakes, and cakes. I will buy these for years to come! I love these boxes! We decorated them and used them for our holiday cookie boxes that we hand out to family this year and they turned out great! Will definitely be ordering these again next year! I bought these because I was ready for a new look with my cake orders. The customers rave over these boxes because it allows them to see the cake & awe over it after their pick up. Instead slitting the seal and taking a peak. These were a great choice and I would recommend this as a MUST BUY!!! The boxes are sturdy and easy to assemble and fold. They don't fall apart, and are sturdy to stack a couple on top of each other. The window is a good size to display the products inside! Well packaged and delivered. This box is great for sheet cakes or for large cookie orders. Folds up well and is quite secure. I was completely satisfied. We love these boxes because we use them for so many different things! From 1/4 sheet cakes to 1 dozen cupcakes (with the insert) to decorated sugar cookies, these boxes perfectly showcase our creations! Absolutely love these boxes for my cake and cupcake needs. Very sturdy and holds well during transportation. Fits up to 12 cupcakes with divider or 1/4 cake. Beautiful looking boxes which are easy to assemble. I love the window, it allows your clients to see what's inside without opening the box. Publix used the same boxes. I got these cupcake inserts and the boxes. They are nice and strong and it keeps my cupcakes in place. I really like them.I will also buy these again. If you are looking for the perfect window box for 1/4 size sheet cakes or two dozen donuts without spending a lot of money, this is the box. Sturdy construction and large window for viewing make this box an all-around winner. These boxes are sturdy, a great value for the quality. The clear window is eye appealing, my customers love to be able to see their items right away. I looked all over for boxes and finally found what I was looking for. They are very attractive and sturdy boxes for my baked goods. My customers love them! I use these cake boxes to deliver cakes in town holds up very well and it has the clear top the customer like them to and a great price. This is THE best box for my cakes and cupcakes. My cupcakes are beautifully displayed and look very professional. My 13x9 cake is also a perfect fit. I will definitely reorder. This is a perfect bakery box for cake or cupcakes. It is sturdy and the locking sides are made well, such that tucking in the sides will not hit the sides of your cake and cause damage. I love these boxes! Perfect for tarts and brownies/bars. I normally stuff the bottoms with box filler to make it pop. I put our logo on top and its perfect for viewing! These are my go to boxes. They are sturdier than anywhere else, and never damaged in shipping due to their shipping them in large boxes. No need to look further. These boxes are amazing! I use them for cupcakes, cake pops and chocolate covered oreos. They are sturdy, classy and the price here is unbeatable! Search for yourself, you WILL NOT find a better deal! Love all sizes and variations to the white cake boxes! When I have a ton of cupcake orders, the windows make it some much easier to see what is what! You can use the 12 cupcake inserts in these as well! This was the best investment I ever made into my small home based business. When I first started I was using plastic 6 spaced cupcake holders that would squash the tops of my beautiful cupcakes when closed. These boxes hold more at a time 12 (need the cupcake insert), have a high top which prevent squashing, and look very professional. When I give my custmer their cupcakes I know they are secure. I LOVE these window boxes, they are sturdy, and show off the cupcakes and cakes beautifully. They are also very easily assembled, it literally takes a couple of seconds! I used to get the boxes with out the windows. Now, with the window, my customers can see the cake with out opening the boxes. Love it! Love these boxes for my cake pops. The presentation is beautiful because you can see the pops through the beautiful box. Well constructed and gorgeous. Couldn't ask for more. These boxes are sturdy beautiful and a great price! I have been through every box company and these are the best! I will never buy from anyone else! These are the only cupcake boxes I will purchase! I'm an at home based business and it was hard trying to package my cupcakes while trying to make them look somewhat, "professional." These boxes are great. I've been using these boxes to package my cupcakes for over about a year now. I love that they don't look cheesy or tacky. I also love that they have a window. It adds a nice touch, whenever there are decorations on any cupcakes I make. These bakery boxes and classy and functional. They make my special orders look professional and are relatively easy to put together. Plus, they are very durable. Great box! Easy to fold and secure the cupcakes in! Nice clean look. I like that it doesn't take a rocket scientist to figure out how to put it together. These are my favorite cupcake boxes ever! As you can see, the product looks beautiful in these with the window. These are priced perfectly too! These boxes are a godsend for my cupcake presentations! They are well made and sturdy and look a lot better than the plastic clam shells I was using previously. Less expensive per piece too. A definite buy! I will definitely buy more of these. The window is perfect for getting a sneak peek at the goodies. No need to cut the tape on the box anymore to see whats inside. I use this with the cupcake inserts and also for 1/4 sheet cakes. I also recently started using them for personalize decorated sugar cookies. Great way to display your work without worrying about the kids touching them before dessert time. I personally love the little window cutout on the top of the box. It is great for displaying the baked goods and cakes that are inside. These boxes are fantastic! I love the design of the window cut out, it makes a nice look for baked goods. I will definitely order these again! Great cake and cupcake boxes!! Super easy and quick to assemble and can be easily decorated with company stickers or ribbon to add a nice touch. Customers always leave with a smile! Very Nice sturdy boxes. The best use I have for them is for decorated sugar cookies. They can be layered in and I can fit 3 dozen at least. for such a great price seriously who could ask for more. They are beautiful for people to walk about and see what an awesome product you have given them! I like these so much because it lets you see whats inside. You know theres a special cake for somebody so you'll be extra careful not to smoosh it! I think the window boxes are a much nicer prsesentation and I love having a supply always available. I did quite a bit of price comparison and this is the best price I found. These boxes are perfect for 24 of my mini cupcakes or 12 regular size cupcakes. The box is pretty because it's white and you can see your product through the window. These bakery window boxes are high quality and make for a very attractive display of our fresh bakery items and cakes. The size is a must have for every bakery. Nice sturdy boxes that hold weight without bending. Nice window that displays finished product. Easy to assemble. I compared to many others and this is the best price around.